Spain, is it a kind of religious war bullettin? «A praise to God». 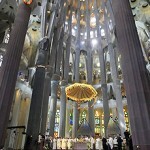 That’s how Pope Benedict XVI defined the Sagrada Familia, which he consecrated the last November. Sagrada Familia remained under construction for about 128 years. Andoni Gaudì, a Catalan architect, was the genius who projected that monumental church. He died ran over by a streetcar, leaving his masterpiece unfinished. 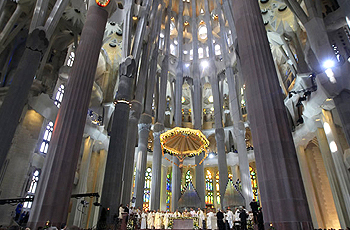 Sagrada Família is an exceptionally powerful lesson for the sacred art of today: the exact opposite of so many modern tendencies toward bare and empty geometry in which the Christian mystery is lost, instead of making itself seen and lived. Someone hypothesized that the empty geometry of these modern Cathedrals is one of the reasons why a priest can lose his faith. Gaudí and the architects and artists who continued his project – from Lluís Bonet i Garí to Joan Vila-Grau, from Josep Maria Subirachs to Etsuro Sotoo – have created a work so rich in symbols as to demand time, competence, and passion simply to read it. Gaudì conceived his masterpiece as a place where a man could get in touch with God in the middle of a garden. In fact, Sagrada Familia is the only European church that stands in the middle of a cloister – it represents the contact with God out of the desert, Barcelona itself. The pyromaniac that the last week set fire to sacred paraments inside the Sagrada Familia come from the same desert of Barcelona. The fire reached the central nave of the basilica. The stake blackened the walls of the 40 square meters sacristy and damaged the furniture. Luckily, Gaudì’s stained glass window suffered no damages. Was he a mentally deranged person? It is probably so. But the fact that the fire was set to sacred paraments is food for thoughts. In the iper-secularized Spain – where Zapatero era is now going to an end but at the same time Satanic sects are flourishing (there are more than 50 in Spain, mainly in Madrid, Barcelona and Valencia areas) – the anti-Catholicism was truly on the spot during the last month. A long preparation to the Holy Week. Lay and atheist associations – it’s consequential – also invited to boycott the Holy Week itself. It was not enough. So, they organized an anti-Catholic event scheduled for the Holy Thursday: an atheistic procession against the Religion. A prank against liturgy. It is called «freedom of expression», but it infringes religious freedom. This is the point that Holy See brings in international meeting. It can be considered the main diplomatic fight of the Holy See, and it is sufficient to read the last message for the World Day of Peace (dedicated to religious freedom) to understand it. This issue seems to be a crucial issue in Spain, too – considering that the next World Youth Day will be held in Madrid in August 2011. Let’s roll back the last month events. Madrid, Complutense University, 8th of March. Contrapoder, a student radically left-oriented association, begins a feminist seminar in the Faculty of Sociology and Political Science. The seminar is organized in cooperation with Rosa que te quiero Rosa, a pro-homosexual association. Tuesday, the 10th of March, both the associations agree to organize a performance to give their seminar a conclusion. At 1 pm, about 60 girls walk in a sort of procession to the chapel of Somosaguas Campus. They read a selection by Thomas Aquinas, accused to be misogynous. They finally break in the chapel a little before 1.30 pm daily Holy Missal, they undress from the waist up and they engage in lesbian behavior, while singing offensive slogans against the Pope, the Church, the Catholics and blaspheming. Everything was filmed by the girls. Nor the deanery, nor the rectorate of the university go beyond a verbal condemn. They denounce the fact to the police, but there is no strong protest. And the Church itself seems to act prudently. It was not such a piece of news: in 2008 , groups of feminists broke in the Chapel of the Faculty of Law, and smoke and yell: «Alejad vuestros rosaries de nuestros ovarias, away your rosaries from our ovaries». Change of scenario. Barcelona. The Holy Missal in the chapel of the Faculty of Economy had been suspended for months, as a consequence of the attacks during the celebration began in November, in reaction to the Papal visit. Another change of scenario. Madrid again, December 2010. Cardinal Antonio Maria Rouco Varela, primate of Spain, is invited to hold a conference in the Universidad Autonoma de Madrid. The conference cannot take place. “We cannot guarantee security”, a government spokesman says. This is the climax that brought to the Holy Week boycott. The idea belong to Amal (Atheistic and Freethinkers Association of Madrid). They manage an atheistic procession during the Holy Tuesday in Madrid. The route of the procession is designed to skirt the religious processions one – there several Holy Thursday processions in Madrid. It is a fair provocation, as one can easily understand by giving a glance to the names of the associations that take part to the procession: Auto-Masturbation Virgin Confraternity, Congregation of the Cruel Inquisition, Fraternity of the Holy Pedophilia, Confraternity of the Holy Steal Pope. The procession, indeed, could not take place, since the Madrid city administration did not allow it. The procession was not considered – as requested by organizers – a celebratory event. «We are not going to authorize – a Madrid administration spokesperson said – in any case, any joke against the faith and the conventions of the citizens, may they be Catholics or of any other religious confession». More than 100 thousand citizens signed a petition to protest against the Atheistic procession. On the other side, Amal explained that the procession would have been a «part play part vindictive activity. It would have been an intervention in the public space to underline the moral and social hypocrisy represented by Catholic Holy Week». In the mean time, some Catholic lawyers brought an action against Santiago Ochoa, the president of Amal. Mr. Ochoa was charged of four accusations: provocation of hate for religious reasons, illicit reunion or demonstration, crime against religious feeling and crime of genocide. Will be this the way to fight the religious freedom violations? One Response to Spain, is it a kind of religious war bullettin?